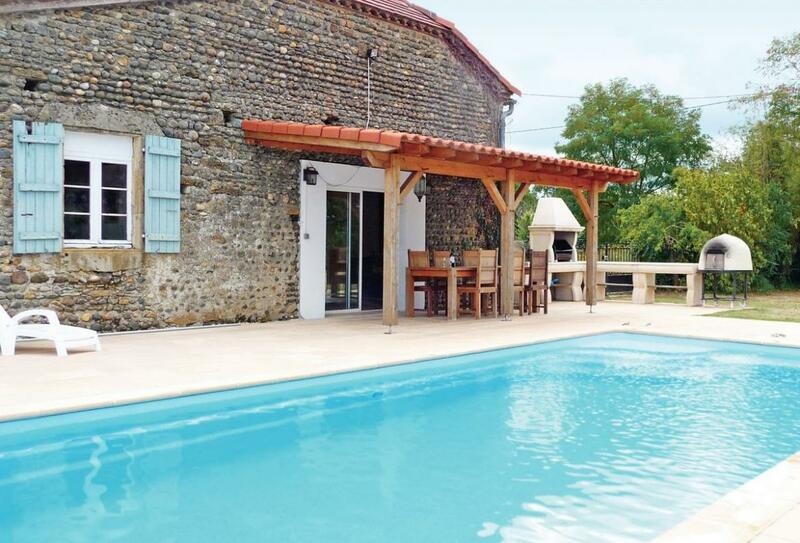 Beautiful 6 bedroom holiday home to comfortably sleep up to 13 near Aignan, Midi-Pyrenees. Ideal for a family holiday, this self catering home offers a private pool area that's ideal for the kids and has everything to make your holiday unforgettable! On site parking. Cot available. Highchair available. Pets not accepted. These two charming holiday properties (ref W15086 and W15087) are situated in the Gers region, an area characterised by sleepy bastide villages and rolling hills, with the Pyrénées visible to the south. La Maison Rouge (ref W15086, with private swimming pool) is a beautiful old stone house that has been tastefully restored creating a very comfortable and welcoming holiday home. In the garden, a covered dining terrace sits next to the very inviting private outdoor swimming pool. The adjoining cottage (ref W15087, no swimming pool) has been renovated to a good standard and provides all the necessary comforts for a great holiday. It has a lovely covered terrace for al fresco dining. There are many small villages to explore within easy driving distance, offering the opportunity to sample the local gastronomic specialities including Armagnac, Côtes de Gascogne, foie gras and wild mushrooms at the tempting restaurants. Maubourguet’s Tuesday morning market is a feast for the senses, with the specialities of the region aplenty. A little further, Aire-sur-l’Adour is on the road to St Jacques-de-Compostela. The local area offers a range of activities, with lots of hiking routes, proximity to the Pyrénées for adventure sports and, owing to a long association with horses, many equestrian centres. Visit the ancient towns of Aire-sur-l’Adour, Auch the capital of Gers, or Lectoure, a beautiful hilltop town. The properties are also a 10-minute drive from the famous Marsiac Jazz Festival. Shop and restaurant 5km, café/bar 1km. Ground floor: Lounge/kitchen, dining room, utility room, bathroom with shower, toilet and basin, separate toilet with basin, 1 kingsize bedroom. Mezzanine with play area. First floor: 2 bedrooms: 1 kingsize, 1 child’s twin plus child’s four-poster bed. Second floor: Second lounge, bathroom with shower, toilet and basin, 3 kingsize bedrooms. Oil heating, woodburner in lounge and dining room, cot, highchair, DVD player, CD player, wi-fi, washing machine, dishwasher, microwave, garden, terrace, garden furniture, barbecue, outdoor swimming pool (private, 8m x 4m, depth 1.2-1.5m, open Jun-Sep weather permitting), off road parking for 1 car. Sorry, no pets. No smoking please. NB: Sloping ceilings on second floor. Open sided, open-tread stairs to mezzanine.